Along the trail of learning in the art world we at some point have to accept the fact that composition is a crucial element to a complete painting process. This was a subject I put off learning for some time. I was probably like the new music student learning the notes to play an instrument who says to his instructor “Do I have to learn all of this? Can’t you just teach me to play a song?”. I just wanted to paint. Composition and color theory and all that stuff seemed like such a boor! But as musical notes give the musician freedom to play and create beautiful sounds so does composition add to the painter’s ability to successfully express on canvas with the bonus of engaging and leading the viewer. Whether using a basic “L” or “S” shape or a bit more complex application, I am convinced that any path to follow is better than none at all. I can highly recommend a book by Ian Roberts, “Mastering Composition” for an in-depth introduction. I am a big fan of structure and processes and Ian does a fantastic job of cleanly laying out information in a way that allows you to memorize the concepts. Of the many available tools to composing I have used one more than any other. A method that utilizes the golden mean called Dynamic Symmetry. The golden mean was used by the ancient Greeks in art and architecture and can be found everywhere in nature, even our own bodies. It is said to be the most appealing mathematical division of form and is calculated using a 1 to 1.618 ratio on any length of distance. For example a canvas of a 20″ width would have a golden mean vertically at 12.36″ (20/1.618). If the canvas was also 10″ high the horizontal golden mean would be 6.18″ (10/1.618). The “sweet spot” of a painting is said to be where these vertical and horizontal lines intersect one another. As with many things the introduction of one concept or idea often leads to others. In this case the discovery of the golden mean lead me straight to Dynamic Symmetry. Using the same 1 to 1.618 ratio it also divides the canvas into multiple useful sections as shown in the below example. Example of Dynamic Symmetry. To do this yourself first find the ratio of 1:1.618. Next I have color coded the lines to allow us to put them in the proper order. At the measured distance of 1:1.618 lay in the light blue line. Next the orange, yellow, green, blue and red. If done correctly your series of lines should look just like mine. (No, you don’t have to do them in color) The smallest rectangle is your “sweet spot” and the other lines can be used with your composition. 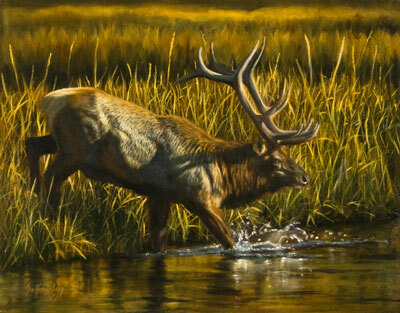 This method has been used successfully by many artists from Da Vinci to the father of wildlife painting Carl Rungius. I have done a layover to one of my paintings, “The Playground” to better demonstrate Dynamic Symmetry in action. “The Playground” by Joe Kronenberg with Dynamic Symmetry layover. Though I was unable to get a wolf’s head completely into the sweet spot, all four heads surround it. Notice also the eyes of the black wolf are on one of the lines. The diagonal line on the left separates the black wolf with the white wolf next to it. 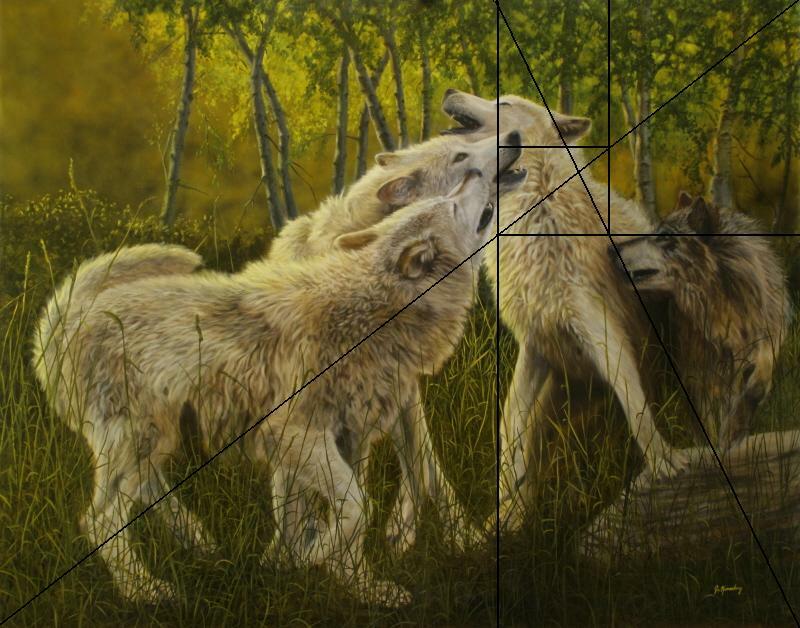 The wolf stepping on the rock is almost completely enclosed into one of the triangles with its leg on the right following the angle of one of the lines while the leg on the left lies directly at the golden mean line. Also notice how the black wolf is almost completely enclosed in the inverted triangle created by the diagonal and the line at its eye. 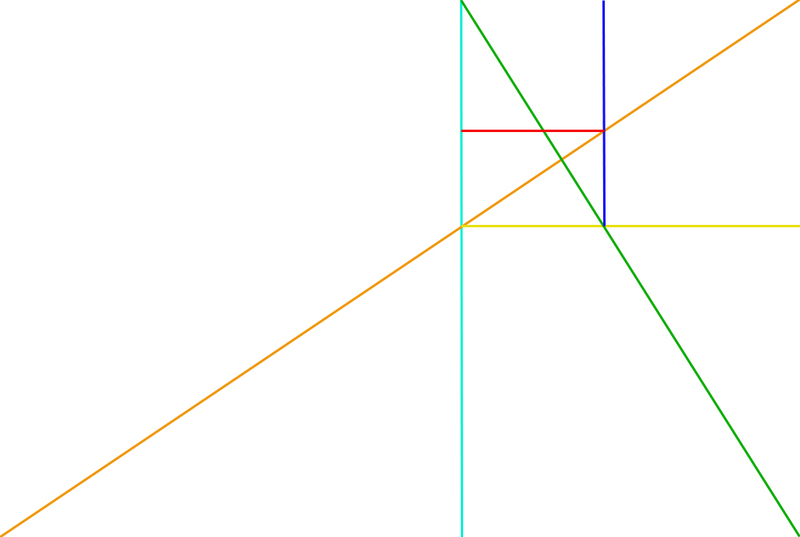 And finally, I was able to structure the entire painting on the larger triangle created by the two angled lines. Triangles have been used as armatures for centuries having a fantastic visual appeal. You can probably tell I have embraced and even gotten excited about compositions. Like that music student when he decided the real freedom lied in learning to read notes, I can now better express on canvas. There are those who argue this golden mean idea is nonsense and makes little difference where the viewer is concerned. I can’t say I agree, but the truth is, I don’t really know. What I do know is at the very least compositional tools give the artist structure. With structure comes peace of mind and confidence in your painting process. Leave a comment Posted in Thinking Out Loud Tagged "Mastering Composition" by Ian Roberts, Carl Rungius, Composition, Dynamic Symmetry, Golden Mean, Golden Ratio, Ian Roberts, Joe Kronenberg "The Playground"
It was not too long ago (about six years) that I decided I was going to make the transition from pastels to oils and I can remember being full of excitement about the idea, and of painting on huge canvases and having the smell of oil paints fill my studio. Though I had read up and studied a bit I soon came to the realization that I knew very little about the process of oil painting. Being heavily inspired by the mood of the old masters and the vibrance and light of the Hudson River School of artist’s tonalism and luminism techniques I set out to learn as much about their methods as I could. Now, some years later I have developed and use four different classical methods either in whole or in part to get the result I am hoping for. 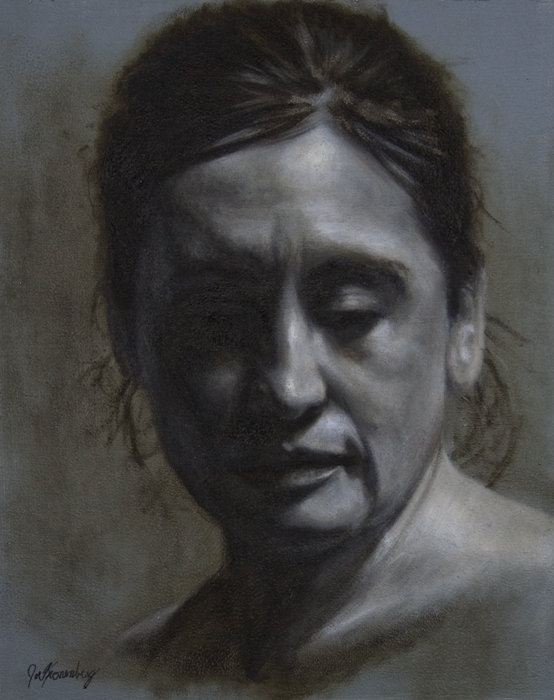 Of the four the one I enjoy both using and teaching the most is an almost six-hundred year old method called “grisaille” (pronounced ‘griz-eye’), which is followed up by a series of glazes. At about the end of the 19th century came the introduction of direct method painting, or impressionism, followed by post-impressionism then modernism. Right along-side these new methods were the critics of the day touting praises upon them while chastising the classical schools with their old rigid rules and methods of painting as being unenlightened and outdated. The result…less than a quarter century later the once world famous academies of art (Ateliers) were all but gone. Taking with them their centuries old techniques and methods of training. The good news. Many of those methods were preserved at some level through writings and a very limited number of trained artists that could claim an unbroken chain back to the masters of old. 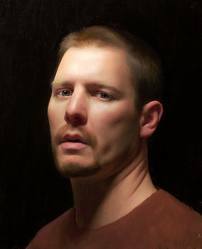 1) Draw your image onto your canvas or painting surface with a pencil or charcoal. Once you are done with the drawing be sure to spray the surface with some workable fixative to prevent your drawing from coming off at step two. 2) I prefer either Paynes Gray (for cooler results) or Raw Umber (for warmer results) to tone the canvas with to a mid-range of value. This can be done by thinning down the color with some turpentine and brushing it on or by simply squeezing a small amount of the paint directly on the canvas and using a paper towel with a bit of turpentine on it to evenly spread the paint over the surface. 3) Once toned start painting in the darkest areas (values) of the image. The toned surface does much of the work acting as your mid-tone. 4) With the addition of white paint to your palette work into your mid-tones and light value ranges, modeling up to your lightest values on the form as you go, paying close attention to detail and creating the illusion of form. 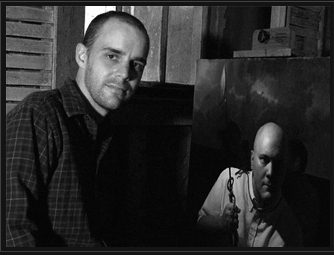 You should have the mindset that you are working towards a completed painting in monochrome. Once complete, you can let it dry and it is ready to glaze in the colors (I’ll cover that process in a future post). Below are some examples of grisaille paintings before and after the final steps of glazing. 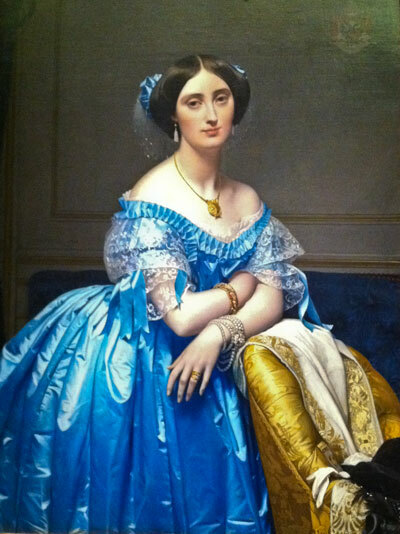 Any time you see a painting with amazing satin you can almost bet it was done with a grisaille base, then glazed as in “Princesse de Broglie” by Ingres. An interesting side note on this painting. As I was viewing it the the Metropolitan Museum of Art in NYC I noticed about an inch or so of unfinished painting at the bottom exposing the grisaille. Take a look at the detail below. You can see about the bottom inch or so of this painting never got glazed. 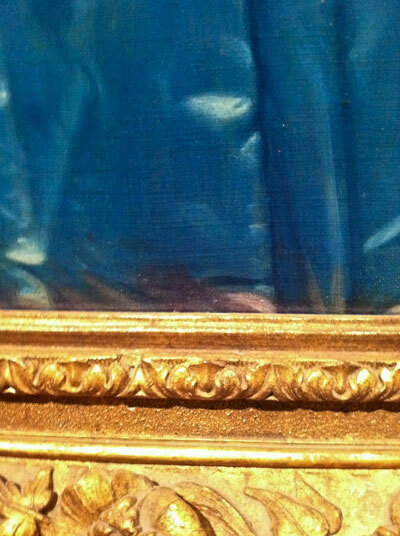 It is the brownish color just above the frame and it goes across the entire painting. “September Strut” by Joe Kronenberg, in the grisaille stage. See the completed painting. I love how the detail of the grisaille can be maintained in the final painting. Completed painting, “September Strut” by Joe Kronenberg. Started in grisaille. This completed painting of “Grand Odalisque” by Ingres hangs in the Louvre. What a great before and after side-by-side! This grisaille of “Grand Odalisque” by Ingres hangs in the Metropolitan Museum of Art in NYC. It is said he painted it after the original as part of a student workshop. 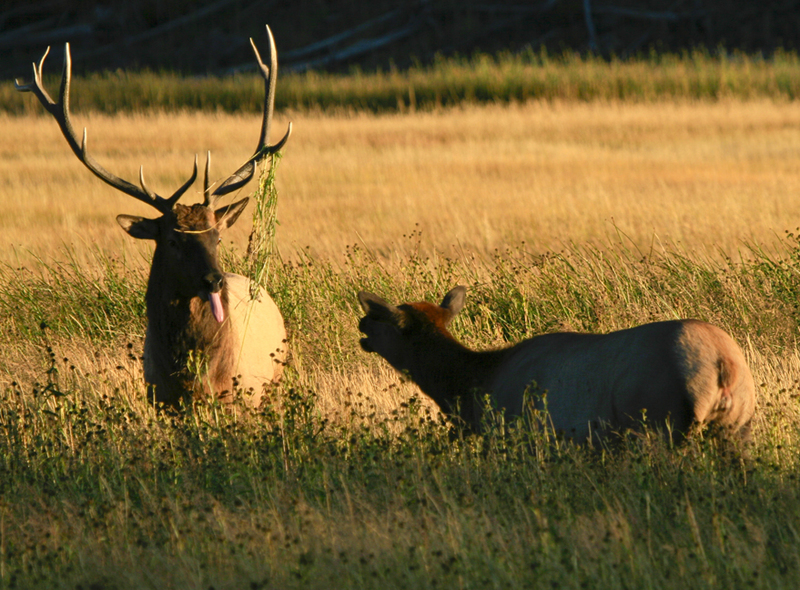 One of the coolest things us wildlife artists’ get to do is collect reference material. If you are serious about getting good reference, the zoo just won’t do. Besides being no fun at all in comparison, zoo animals tend to be over-weight and not as muscular. Many situations are funny, sometimes heart pounding (Like the time I got cornered by a bull moose in full rut. I obviously survived for those of you concerned 🙂 ). 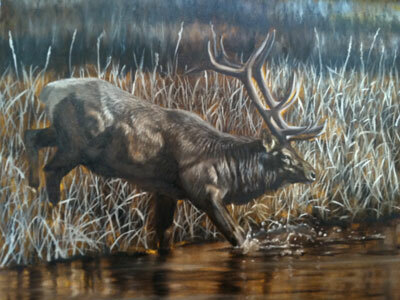 Observation of these animals in their natural environment is of great importance to the artist as well. Getting to know how they behave and interact with one another is invaluable when I’m back in the studio working on new concepts and ideas for paintings. I’ll be posting these and other images regularly on my blog and at my website at http://www.kronenbergart.net. Click “follow” if you haven’t already and you can be notified with each post. River Otter photographed in Yellowstone National Park. We hiked just a short distance above Mammoth to a small lake and found these two hamming it up for us. If you look closely, the one in front has a fish on the log. He kept bringing it up to show it off to us. One of my favorite spots in the country to capture images of bull moose in the Gros Ventre River in Teton National Park. If you get up early enough there is nothing like the first light of day bouncing off the antlers and shiny autumn coat of a big bull. This young Pronghorn was photographed in Yellowstone. The Pronghorn is the fastest land animal in North America. To see one of these things tear across an open plain is amazing. As we were photographing the River Otter above Mammoth, we heard some brush rustling behind us. So did the Otters. They made an exit to the other side of the lake. This Black Bear was looking for berries and we were surrounded by them. He didn’t stay long, but we got some great shots before he left. Just outside the west entrance of Yellowstone we spotted some Bighorn sheep through a scope close to the top of the mountainside. It was a looong tiring hike up but the reward was this beautiful light and setting. We had just finished a great morning of photographing Moose on the Gros Ventre River in Teton National Park. As we stood in a small circle sharing stories and preparing to move on we hear some chatter behind us in the river. This family of four River Otter put on a great show for about twenty minutes. Otter number four is out of the frame. No doubt the disobedient on of the bunch off on his own. I can’t take credit for spotting this one. My buddy and fellow artist Chad Poppleton and I where actually out looking for Elk when he yelled, “Buck! Stop!”. He has a great eye. It took me a bit to spot the antlers through the brush as this guy was bedded down. We moved in slowly towards him and as we got close enough to reach with the cameras made just enough noise to stir him up. Just like people aren’t they? She is ignoring him and he is strutting it trying to get noticed. These two were fun to photograph. The setting could not have been better. Great light, water and an active cow and bull moose. This scene almost paints itself! She came out of the brush and headed our direction so quickly, this poor guy had to abandon his equipment. Glad it wasn’t me. He later told me he was “just a bit stressed she might tip it over” as it was about $15,000 in camera gear! BTW myself and the others photographing were so concerned we couldn’t help taking tons of photos. lol. “I don’t know. I can’t explain it.” This was the answer given by me to my daughter when she asked why the Edvard Munch painting “Scream” was worth the $119,000,000.00 it had just sold for. After all most children (and adults) who see the image of this painting are less than awe-struck. A more apt description of the average person’s feelings would probably be “mildly disturbed”. Okay, I get it. It’s telling a story. One of frustration and “losing it”. Something we can all relate to at some level. However, artistically does that create value in art? I can think of many similar quality works I’ve seen in my lifetime that are worth next to nothing, but evoke the same feelings or emotions as “Scream”. What do you feel when you view a Picasso or Pollock? I don’t know about you, but Me?…Yep, still disturbed. Yet I speak to those who have stood in front of the paintings of the old masters and claim to have experienced a host of emotions. Some even brought to tears. I know the first time I stood in front of a William Bouguereau my heart was pounding. I was speechless as I studied a small Meissonier for over an hour. The first Jules Bastien-Lepage painting I viewed still inspires me today as I look up the image of it often online. So…do emotions determine value? No. If it did, the three artists just named would surely have commanded millions for their work decades ago. It has only been in the last twenty years that any of their work has gained significant value. And that is nowhere near the value of the works of their contemporary modern artists. Back to the original question then. What makes “Scream” and other modern artists’ works worth so much? Let’s look at another example. This last summer I was at the Metropolitan Museum of Art in New York City. After hours viewing the European art I decided to venture into the modern side of the museum and see for myself how I would feel after viewing them up close and in person. I saw textured paintings, splattered paintings, brilliant colors, muddy colors, welded metal sculptures, bronzes and more. 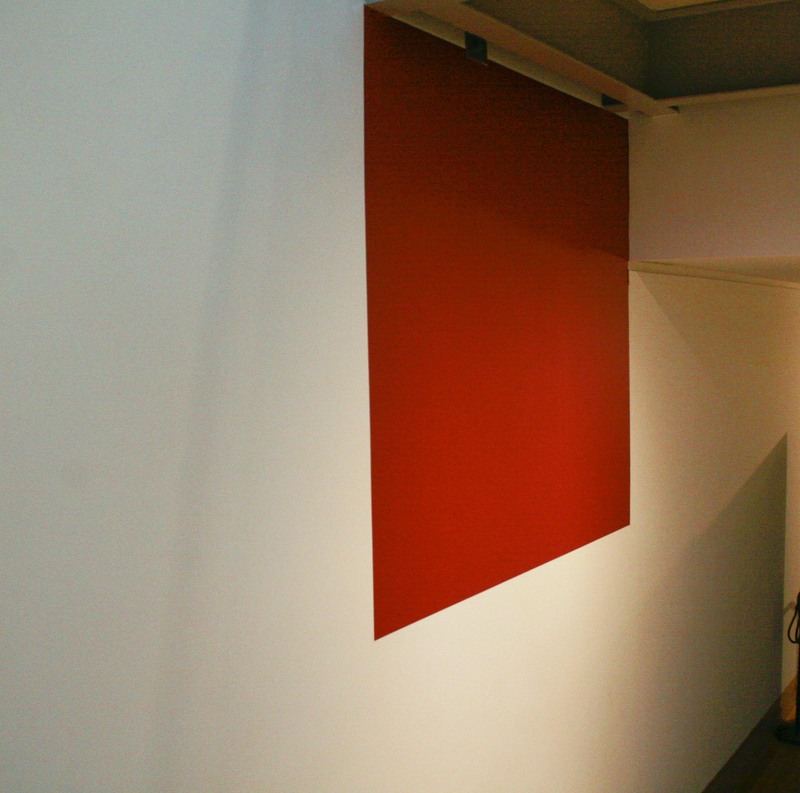 As I went down to the lower level, I stopped in front of a large canvas by Ellsworth Kelly titled “Blue Panel”. 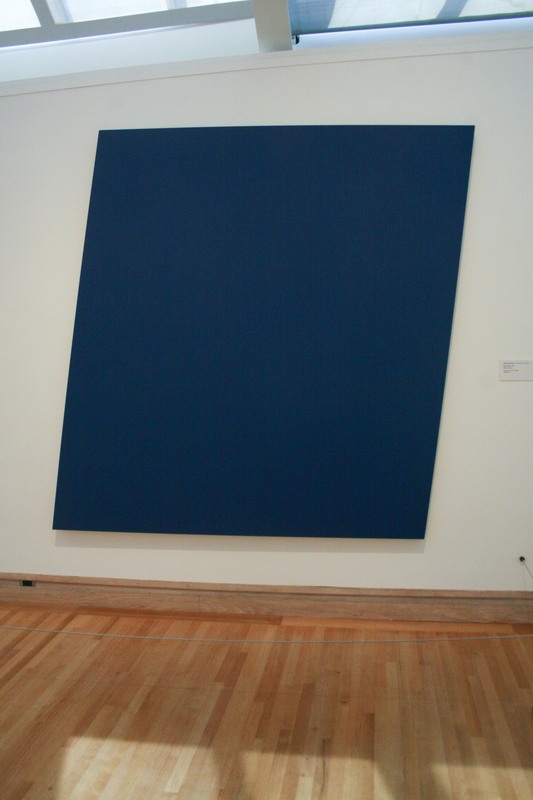 I think more than any work of modern art I had viewed to that point in my life, this made me ask the profound question, “What the…?” A blue panel! Just blue! Minimal thought, no skill or training, only blue. Was I disturbed again? Yes. Only a bit differently. Now it was mingled with a tinge of anger. How could this work be worthy of this prestigious museum? This hanging here was the equivalent to me of standing in front of a grand piano, holding out my index finger and pressing a single key. Then being approached to repeat my performance to a sold out crowd at Carnegie Hall! A single note! That is all this painting is, yet it hangs with other works by Kelly in one of the most famous museums of art in the world. I have the answer! I had it all along. I know why someone paid $119,00,000.00 for “Scream”… Prestige suggestion. I only learned of this in recent years while listening to a key-note address given by Fred Ross, the founder of the Art Renewal Center, to a group of artists at the national Oil Painters of America event in 2006. Not being one for public conflict you sheepishly reply, “Well, I, I, I guess I did. Yes”. Aware of the people surrounding you within ear shot, you reply “Well, I’ll bet it’s much more difficult than it looks. After all, we don’t know the story behind the painting. The emotion and feeling that went into creating it.” He reluctantly agrees and you move on to the next painting. You have not only just been victimized by prestige suggestion, but passed it on to your friend! That women you met at the gallery months ago made you feel as though you were unenlightened because you did not “get” that artist’s work. In order to not feel that way again you surrender what you know to be true with what you are supposed to “feel”. Now your friend from work will probably pass it on to others as well. I think most everyone has experienced this in one form or another. Whether from teachers, friends, spouses or strangers. Please don’t think however that I am lumping all modern art and artists into this large pool of “unskilled work by untrained hands”. Much of modern art requires more than expression to create. Skill and training do come into play in many works. I am like many people I know I guess who look at the work of some artists and ask, “Why is this special?”. Expression is supposed to evoke emotion isn’t it? First the artist, then the viewer of the art. Am I just bitter because I have spent years of study and training in the hopes of developing skill? Not really. It actually gives me piece of mind to know that very few people could duplicate what I do. My style and application of paint is uniquely mine. Much of modern art however can be closely reproduced with not much more than a materials list by just about anyone who wants to give it a go. Does that bother me? No. Let the modern artist create all they want and display it anywhere they choose. Just don’t suggest people are unenlightened or judgmental for having an opinion less than favorable about these kinds of works.